Corby Town return to Steel Park this weekend knowing their route to promotion now lies through the play-offs. Any lingering hopes of securing the sole automatic spot were all-but ended as the Steelmen slipped to a 2-1 defeat at leaders Bromsgrove Sporting in front of over 1,500 fans last weekend. 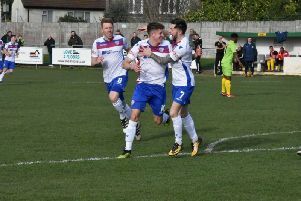 That loss has now left Steve Kinniburgh’s men 11 points off top spot with just six games remaining and it now looks set to be a straight fight between new leaders Peterborough Sports and Sporting for the Evo-Stik League South Division One Central title. But Corby have plenty of breathing space as far as the play-offs are concerned and look almost certain to finish in third place to ensure they will be at home in the semi-finals of the extended season. And while boss Kinniburgh admitted it has been a frustrating March for his team so far with just one win from five matches so far this month, he knows his players must focus on what is in front of them - starting with this weekend’s home clash with Berkhamsted. 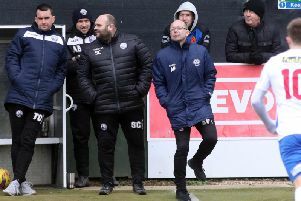 “I think maybe three or four weeks ago we knew in our heads that we were heading into a run of games in March that would be decisive in whether we would continue the automatic promotion push or whether it would be the play-offs for us,” Kinniburgh said. “With the way the results have gone, it’s looking like it will be the play-offs. “It’s frustrating. I think the majority of those games could have gone the other way but they went against us. “But we have to keep going. We have had a great season and we have put ourselves in the position where we are looking likely to finish in the top three and have a go at the play-offs. “And that is what we have to look towards now. “The preparations have already started as far as I am concerned. I have looked at a few different players and a few different formations recently. “And I now feel that I have got what I believe to be the best approach to take us through the end of the season and into the play-offs. Following the restructuring of the leagues last summer, only five of the seven play-off winners with the best points-per-game ratio, will be promoted from Step 4 this season. As it stands, the Steelmen are in a strong position as far as their points-per-game ratio is concerned, meaning they will go up if they were to win the play-offs. And Kinniburgh said: “We have to try to finish strongly for a couple of reasons. “Obviously, you want consistency when you are heading into the play-offs. It’s important we get on a good run and go into the play-offs with a bit of momentum behind us. “But there is also the issue of the points per game ratio. We have to make sure we there’s no way we are going to be one of those teams that is going to miss out due to the points per game rule that is in place. The Steelmen, meanwhile, should head into the final six matches of the regular campaign with a fully-fit squad after full-back Miles Smith returned to the bench in last weekend’s 2-1 defeat at leaders Bromsgrove Sporting following a thigh problem.